In the final days before the snowstorm, I managed get my act together and squeeze in the acquisition of half a cord of wood. I had been procrastinating on this because we've been discussing a move in our near future. We didn't entirely expect to be here for the winter. About a month ago, I started looking at Craigslist ads and finally pulled the trigger on a local seller in Charlotte. Much closer than I expected to find anything (I envisioned driving halfway across the state). On a rainy day, my neighbor let me borrow the Adventure Garage trailer, and even went with me to help me load up. 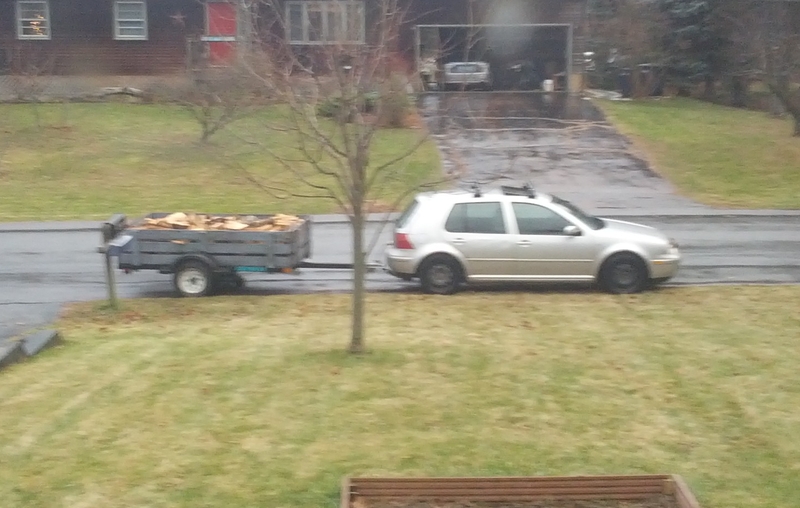 Hooked up the trailer to the Veggie Golf and headed to the seller's place. 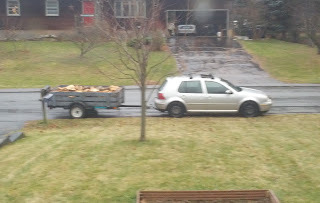 In a perfectly timed break in the rain, we pulled into his lot and loaded up the trailer. The wood was nice stuff, perfectly split, but pretty heavy and wet. I never thought to ask if it had been seasoned, but it was pretty obvious it hadn't. It took about 15 minutes to load it - turns out a 5x8' utility trailer holds pretty much exactly a 1/2 cord. Due to a miscommunication, the seller wasn't there but trusted us to load up and said he'd meet us soon. (Actually about 45 minutes later - he got stuck in traffic trying to get home). We ended up meeting him on the side of the road, where he carefully measured the load in cubic inches and charged us according to some formula he had determined. It was a fair price for a half cord, even if it was green. I got it home and planned to drop the trailer right in the backyard. Unfortunately, I remembered too late why it's a bad idea to try to drive a front wheel drive vehicle on a muddy lawn. After a fairly thorough job of tearing up the lawn, I still couldn't actually get the trailer past the side of the house. The ruts should heal up okay in the spring with a little grass seed, but... ouch. The next day it stopped raining and got cold enough that the ground firmed up a little. Susannah, Rick (friend and temporary roommate) and I got the trailer half emptied using a wheel barrow, and finally I was able to back the trailer the rest of the way. Dumped it, and stacked the wood up - the amount fit perfectly into the cradle I had built. We've been burning it almost every other night. Being green wood, it takes a lot to get it going, and it doesn't produce much heat, but it does burn and it's better than not having any wood. I've gotten pretty good at building the fire exactly the right way so it will take off first try. I shudder to think of what it's doing to the chimney, but I'll have it swept in the spring before we sell the place. Other than that, I'm happy to have gotten this done before the big snow, or there would not have been a chance!